Inspired by the bounty of upstate New York, this charming breakfast basket showcases three of our favorites from Claire Marin, founder of Catskill Provisions. The pancake mix is made from organic, traceable wheat grown and milled in New York, and contains recipes for making light, fluffy pancakes every time. New York State Grade A Maple Syrup is tapped from 2000 maple trees in Sullivan County, and provides a delicious way to enjoy one of New York's important sustainable resources. Finally, taste what the bees taste in Catksill Provisions Fall Honey. With subtle notes of chestnut, maple, goldenrod, buckwheat, bamboo, and asters, this is a honey to spread on toast or drizzle over yogurt, oatmeal or fresh fruit. 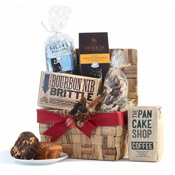 Nestled in our woven hyacinth basket, this is a perfect gift for a family and a healthy, tasty way to say "thank you". Catskill Provisions - Organic Pancake & Waffle Mix: Produces light, fluffy pancakes - every time! Catksill Provisions - New York State Grade A Maple Syrup: Light bodied and flavorful, with multiple uses in the kitchen. 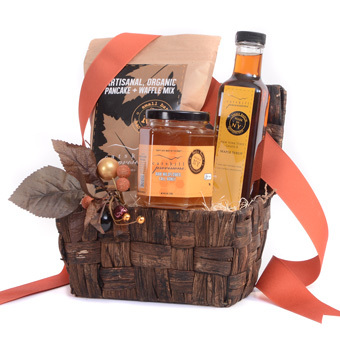 Catskill Provisions - Fall Honey: Dark, rich honey harvested in mid-autumn when bees are feeding on chestnut, maple, goldenrod, sunflowers, corn flowers, asters, and daises. Ideal for tea, cocktails, or spreading on morning toast. Chocolate Hyacinth Flipbox, 9" x 6" x 5"